It was a long time since the release of his previous album "Back To The Groove" in 2002. Now Patrick's new one raises like a phoenix "From The Ashes". Patrick's current project features special musicians: Kimo Cornwell ( B3), Joel Rosenblatt (drums), Scott Wilkie (keyboards), Randy Brecker (trumpet), Will Lee (bass), Ada Rovatti (soprano sax), Nathan Brown (bass), Sandy Weltman (harmonica) and Jason Weber (sax). He lives in San Diego since 1982 and it's a result of his long work as a session musician to assemble such an exquisite list of players on this album. Patrick has written all songs for this album. You will recognize that he isn't only an excellent guitar player but also a convincing composer and arranger. A fact that's nowadays essential for a career in a genre which is only a commercial niche in music business. The album starts with Heart Promise, a romantic groove. Jason Weber adds some nice horn and sax arrangements. The song has several layers like an onion-skin. While the lead theme is repeating Patrick is soloing on his guitar. All in best harmony. Although Patrick's electric guitar may disturb some ears of today's smooth jazz radio consultants because of the aggressive tone. Delightfully refreshing. Yes, a vocoder is greatly welcome today's on many pieces. Patrick makes extensive use of this technical function on Club Humphreys. He is playing all instruments. Guitars, drum machine, keyboards and it sounds well. Hope Springs Eternal is featuring Kimo Cornwell on Hammond B3. Kimo Cornwell is keyboardist, composer, arranger and producer of the group Hiroshima. I recently reviewed their new album "The Bridge". The tune is fluent rush. A very special piece is All Day Music. I think the title is ironically chosen. This is unusual music. Since Toots Thielemans we understand the harmonica as a jazz instrument. Sandy Weltman is a harmonica virtuose equally skilled in blues, Celtic, Klezmer, Latin and jazz. His harmonica gives the song a special feeling which is hardly to describe. Andre Mayeux 's B3 harmonizes perfectly with this sound. Hot Pockets guides into the jazz fusion area with icons like Randy Brecker, Will Lee, Joel Rosenblatt. We welcome Will Lee's short bass solo (could be longer) and Randy Brecker's trumpet excursion. But we especially welcome the female sax player Ada Rovatti on sax. Ada is presented by Apria Records where she already has released 2 albums. Ada's affinity to straight ahead music shines through on K.C. Conceived as a smooth jazz tune Ada always finds the backdoor to jazz. Randy Brecker and Ada Rovatti joins on Unsung Hero again. Trumpet meets sax and the guitar is playing the chairman. First Dance is obviously a concession to smooth jazz radio format. Mellow, smooth, soul-stirring, sousing in the romantic atmosphere. 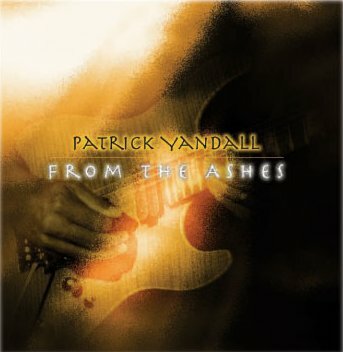 From The Ashes is a wonderful example of Patrick's overdubbing skills. In several layers he adds guitar sounds composing a guitar soundscape of incredible depth. As a guitar player you cannot resist the influence of Spanish Flamenco. Here we go: The Land Of Aros. Joel Rosenblatt inflames a firework of rhythm and Patrick conjures the ghost of Spanish Flamenco on his acoustic guitar. Remarkable Joel's drum solo in the middle part of the song. Song For Bobby presents mellow elements of this album. Jason Weber is a master of silky sax tones. Everybody who has attended Scott Wilkie's live concerts knows what Firestorm means concerning this musician. But on this tune Joel Rosenblatt and Patrick Yandall are the driving forces. Very energetic. One will find very different music on Patrick's new album "From The Ashes". But you can be sure: It sounds professionally and demands your attention. No music for just listening to.